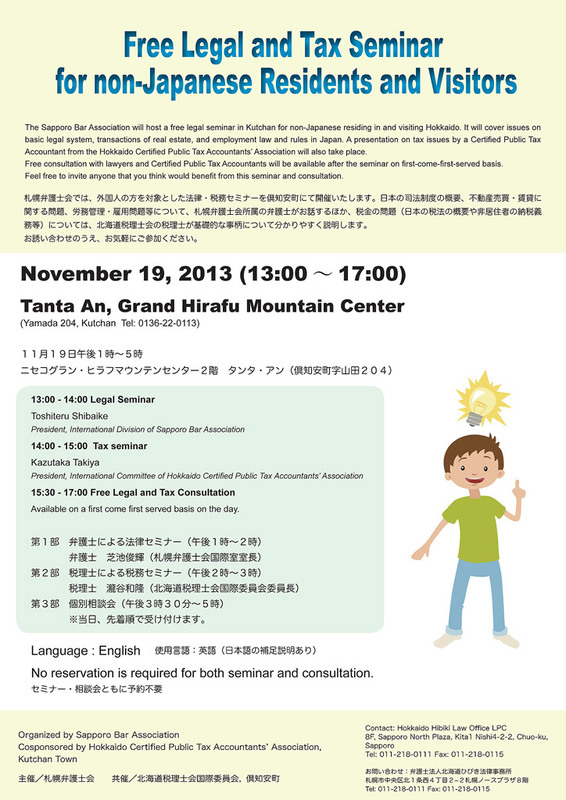 Today at the Grand Hirafu Mountain Center there will be a free legal and taxation seminar held from 13:00 until 17:00. The seminar will be conducted in English and will be a great chance for English speaking local residents and business owners to get a break down on the Japanese legal and taxation rules. Topics covered will include the basic legal system, transactions of real estate and employment law. There will be a free legal and tax consultation period with qualified professionals from 15:30 – 17:00. No reservation is required to attend. The seminar has been organized by the Sapporo Bar Association and cosponsored by the Hokkaido Certified Public Tax Accountants Association and Kutchan Town.